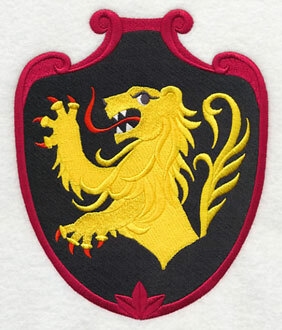 Embroiderers have the best ideas for designs! This week, we're showcasing some of the dozens and dozens of ideas sent in from stitchers around the world in an exciting Request-fest! 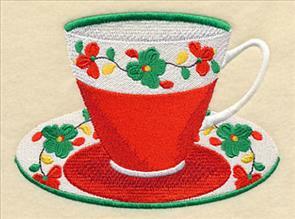 Birds on branches, Oktoberfest motifs, china-inspired patterns -- the variety is astounding! 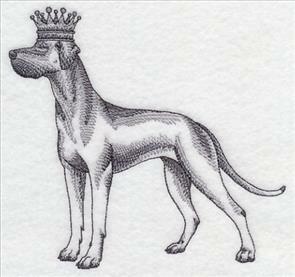 Add a regal pup to a tote bag, or adorn a kitchen towel with an apple clothesline. 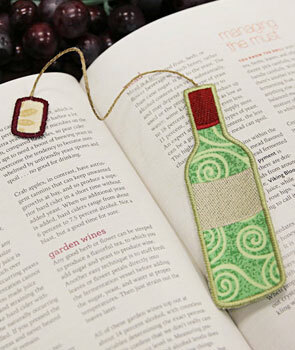 Plus, a new in-the-hoop wine bottle bookmark is perfect for any book or wine lover! 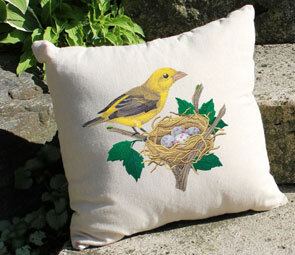 Give an outdoor pillow an all-natural style with these realistic bird designs. 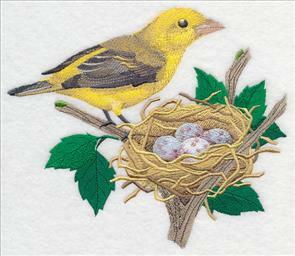 Barb says she "love love loves" the birds on branches designs, and wants "more please!" 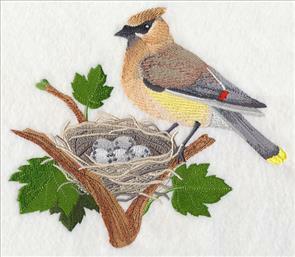 We love these designs, too, and are happy to add a cedar waxwing and scarlet tanager to the collection. 7.79" x 6.84" and 6.66" x 5.83" and 5.54" x 4.85"
Carol was inspired by the patterns found in china dishware, and hoped their beauty could be transformed into embroidery designs. A medallion of vividly colored flowers and leaves is a brilliant addition to pillows, quilts, and wall hangings. 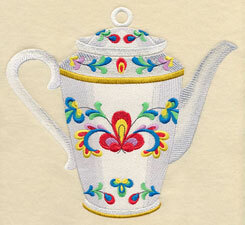 7.77" x 7.80" and 6.90" x 6.92" and 5.83" x 5.86" and 4.87" x 4.88"
A teapot and teacup in this pattern have been created, and are a beautiful way to honor the original bone china. 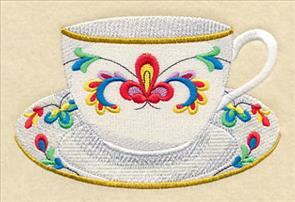 Perfect embroidered on a gift for your favorite tea drinker. 7.81" x 7.09" and 7.06" x 6.42"
5.61" x 3.65" and 5.07" x 3.31"
4.61" x 3.01" and 3.85" x 2.51"
Create a set of table linens with these blooming designs. 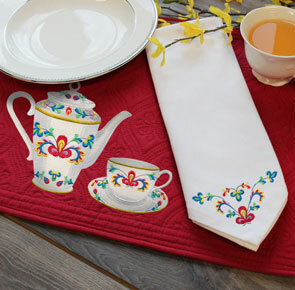 Placemats, napkins, tablecloths, table runners, and more are all wonderful places to show off their color and whimsy. Stitch this colorful spray on pillowcases, towels, bedding, and more! 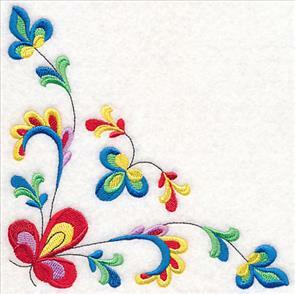 The bright hues add a bohemian look to any embroidery project. 11.01" x 3.89" and 9.40" x 3.32" and 7.79" x 2.75" and 6.86" x 2.43"
A coordinating border design is the perfect way to embellish a table runner or tablecloth. Repeat it several times down the length of your project with the tips found in this helpful video tutorial. 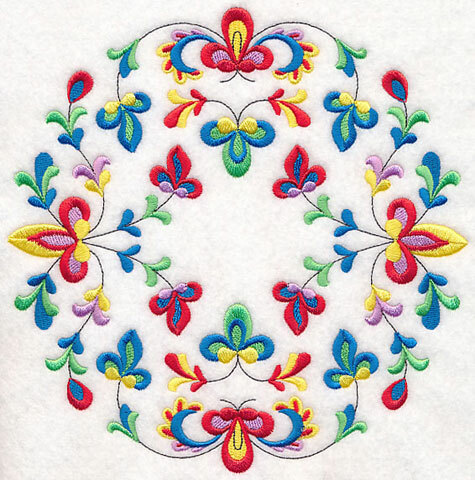 11.01" x 3.70" and 9.39" x 3.16" and 7.79" x 2.62" and 6.00" x 2.21"
Stitch the brilliant blooms corner design on a napkin or pocket, or mirror it multiple times for a unique composition on a pillow. 5.90" x 5.87" and 4.89" x 4.87" and 3.87" x 3.85"
These china-inspired designs will add a blooming look to table linens, quilts, and more. Purchase them individually using the links above, or get them all in a design pack! Lg - Designs smaller than 7" x 11.8"
Md - Designs smaller than 6" x 10"
A second version of the bone china-inspired designs was created thanks to Carol's suggestion. These bright red, yellow, and green flowers are a charming and beautiful addition to pillows, quilts, and more. Great idea, Carol! 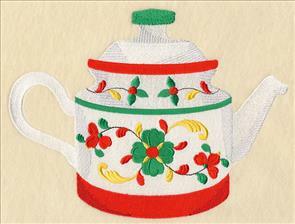 7.81" x 7.67" and 6.98" x 6.84" and 5.96" x 5.85" and 4.94" x 4.85"
Stitch this teapot and coordinating teacup on a pair of dish towels, mug rugs, or aprons. They're gorgeous additions to any kitchen project! 9.00" x 6.86" and 7.81" x 5.95"
5.47" x 4.05" and 4.75" x 3.52"
4.43" x 3.30" and 3.86" x 2.88"
This tasteful spray features one bloom with several smaller flowers and leaves flanking it on either side. Pair it with similar designs, or stitch alone! 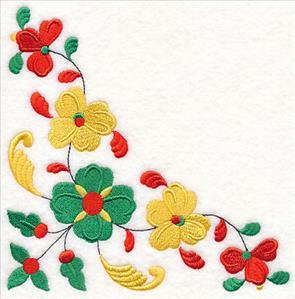 11.00" x 4.24" and 9.40" x 3.62" and 7.80" x 3.01" and 6.85" x 2.64"
A blooming border is a colorful complement to the designs above, and would make a terrific border on a quilt, addition to apparel, or update to a set of linens. 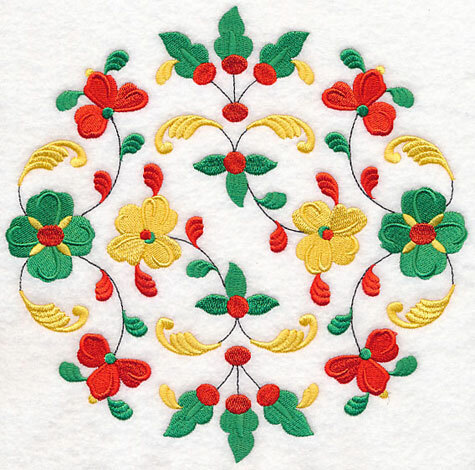 11.01" x 3.72" and 9.41" x 3.18" and 7.81" x 2.64" and 6.00" x 2.25"
Embroider this design on framed artwork, napkins, a pillow, and more with the tips found in this helpful creative corners video! 5.87" x 5.86" and 4.87" x 4.86" and 3.84" x 3.83"
Purchase the colorful flower designs individually using the links above, or get them all in a design pack! 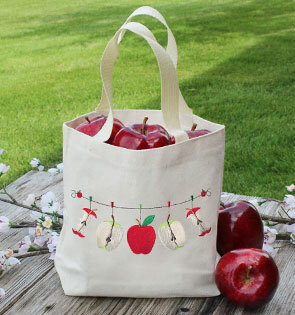 Nicole has an apple-theme kitchen, and was hoping we would create a clothesline that she could use for her decor. What a tasty idea, Nicole! She plans to stitch it on kitchen towels. 9.40" x 4.42" and 7.80" x 3.67" and 6.84" x 3.22"
for your favorite teacher, too! In addition to the clothesline above, a design featuring the ingredients for an apple pie is also available. 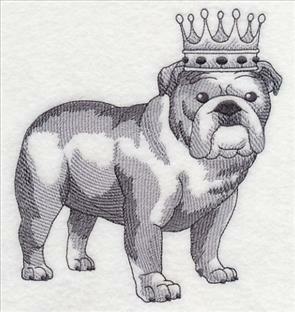 Stitch it on dish towels, aprons, and more! 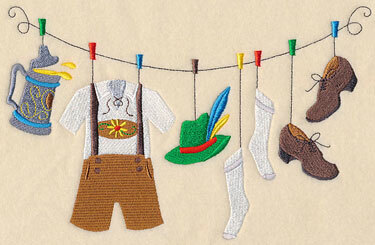 9.40" x 4.49" and 7.80" x 3.73" and 6.85" x 3.28"
Christine requested a variety of Oktoberfest designs -- how fun! 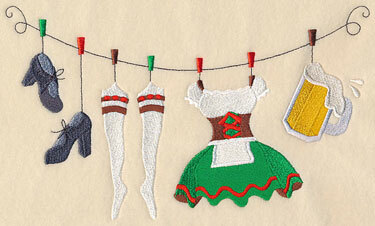 Here a traditional German beer maid outfit is shown in two ways: one on a dress form, and a different version on a clothesline. 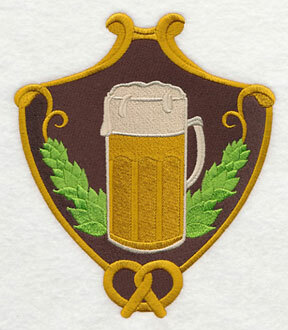 A great way to stitch for Oktoberfest! 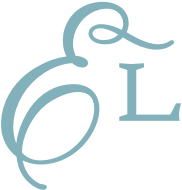 5.66" x 11.71" and 4.54" x 9.40"
9.40" x 5.51" and 7.80" x 4.57" and 6.84" x 4.01"
Lederhosen are the traditional German breeches made of leather, usually short or knee-length. 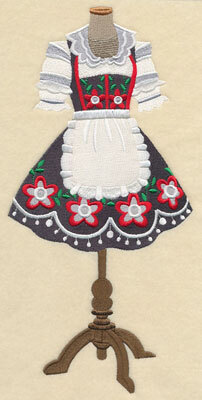 Stitch this dress form and clothesline featuring lederhosen for your Oktoberfest celebrations. 5.09" x 11.71" and 4.09" x 9.41"
9.13" x 5.85" and 7.80" x 5.00" and 6.86" x 4.39"
Be your own brewer with a clothesline design featuring mugs of frosty cold beer and hops. A great way to kick-start your Oktoberfest celebrations, or a fabulous choice for beer lovers, too! 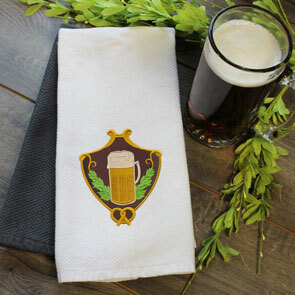 9.40" x 5.06" and 7.80" x 4.20" and 6.84" x 3.69"
German crests featuring a mug of beer and the traditional Oktoberfest heraldry are great motifs for beer towels, celebration decorations, and more! 5.87" x 7.11" and 4.87" x 5.91" and 3.19" x 3.87"
Get hoppy! 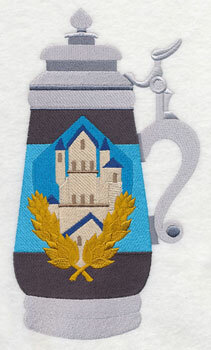 Add these beer-centric designs to waffle weave dish towels, growler bags, apparel, and more to show off your brewmaster status. 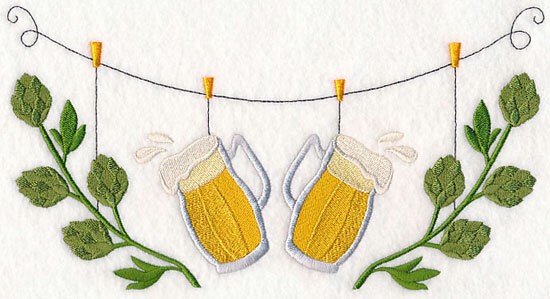 Great for gifts for all your beer aficionado friends! 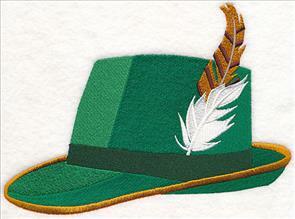 Embroider a beer stein for your favorite German beer fanatic, or a traditional Oktoberfest hat. A fun way to celebrate this classic festival! 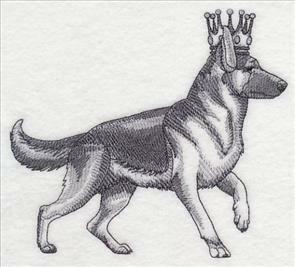 7.57" x 5.86" and 6.28" x 4.86" and 3.86" x 2.99"
Several people are big fans of the sketch-style dogs in crowns on the website, and requested more breeds to match their pups. An adorable way to honor your furry friends! 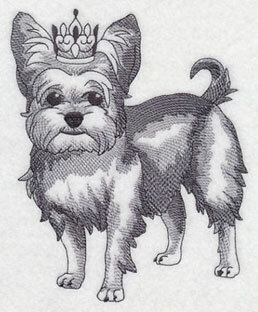 6.50" x 5.84" and 5.32" x 4.78" and 3.88" x 3.49"
A Yorkshire Terrier and English Bulldog look absolutely regal wearing their bejeweled crowns. Add to a pet bed, tote bag, or treat kit -- see all our pet projects here! 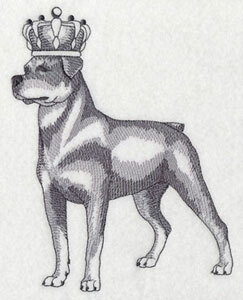 5.85" x 6.36" and 4.85" x 5.27" and 3.54" x 3.85"
A Rottweiler and Great Dane finish off this collection of canines. 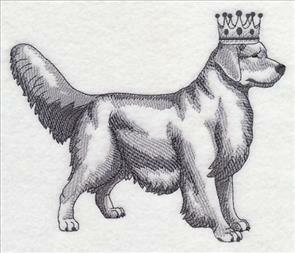 Embroider the four-legged furbabies on your next project! 6.09" x 5.85" and 4.99" x 4.79" and 3.88" x 3.73"
Keep track of your place while reading with a wine bottle bookmark suggested by Lou Ann! 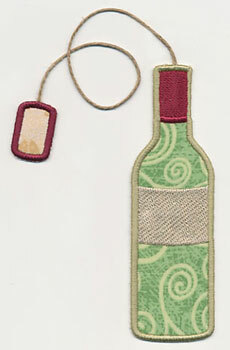 Slip the bookmark in your book, and let the string (and cork!) hang out to show your place. Great for your favorite wine lover! See how to make it here! 2.03" x 5.16" and 1.85" x 3.90"
Not only is this bookmark great while reading novels, but it's perfect for cookbooks, too. 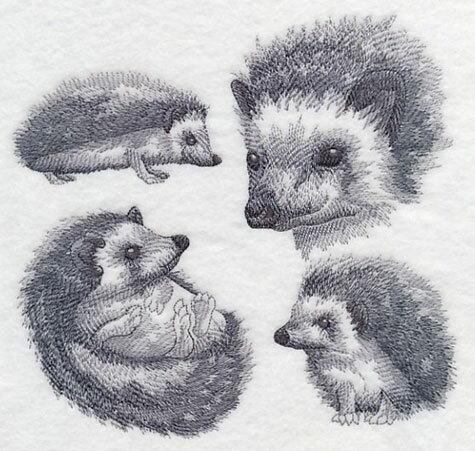 Jane sent in a email requesting a hedgehog version of our sketch medleys. What a great idea! It's the perfect design for owners and lovers of the little animal. 7.31" x 6.90" and 6.18" x 5.85" and 5.16" x 4.86"